Sebastian Duron: Al dormir, "A 2 acompañamiento"
Just in time for Christmas (but not limited to that season) comes a collection of music in which dance and devotion are mixed in equal parts. Perhaps people would go to church more frequently if they knew that the music would set their toes tapping, as is the case here. Spain is not an island, of course. In the 1600s and 1700s, its culture was exported to Central and South America, as well to southern Italy. At the same time, the Iberian peninsula itself was influenced by music and the arts from the rest of Europe and from northern Africa. Muslims and Jews lived among the Catholics, and gypsies added spice to the stew as well. In other words, Spanish culture was not a monolithic entity, but the sum of a diverse national, regional, and spiritual influences. The performances blend Baroque know-how and discipline with a spirit of fun, and also with respect for the music's diverse roots. Savino founded El Mundo in 1997. 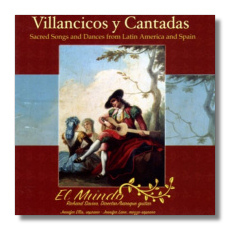 The group's specialty has been Baroque music from the Latin countries, so this repertoire is perfect for them. The two Jennifers, Ellis and Lane, are guest artists. Both are Baroque specialists who seamlessly shift into the more "popular" performance styles represented on this CD. Individually, they sing beautifully, and when they sing together, they discover a veritable "New World" of beauty. Fine engineering, and excellent booklet notes by Savino. Texts and translations are included too. This CD is a winner in every way.